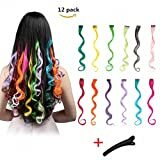 FESHFEN clip in hair extensions hairpieces offer an excellent variety of colors which are vibrant and sweet. FESHFEN hair accessories are well-made by eco-friendly material. 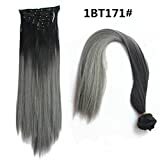 Imported high quality Kanekalon hair extensions; imported metal clips, high flexibility and stability. Each Clip is hand sewed carefully and then secured to hairpieces. Seamless front design, thin and invisible; back metal clips design, easy to attach and remove. Easy to DIY your own fashion hair style. Bright and funky colors are fun addition for causal dress up. A gift to experiment with color without having to do any permanent dyes. Richly colored hairpieces coordinate with your favorite fine label brands, keeping looking classy and feeling confident. You’ll love FESHFEN’s hair extensions party hairpieces or your money back. Organize your hair styles with patterns and colors designed.